Starts off pretty mild and sweet with with flavors of vanilla, caramel malt and toasted sugar hitting the tongue first. Flavor starts to dry out with a hop bitterness that is spicy more than the floral. While the hops are certainly apparent but only make a dent in the malt-heavy backbone. Finish is somewhat dry with little to no aftertaste. Appearance: Clear amber-copper complexion with fluffy, two-finger, off-white head. Sadly head retention was just ok, lasting only a few moments and then settling to a thick film. Lacing was pretty much non-existent with only a skeleton of a spider web remaining on the glass. The mass of cascading bubbles show what should be some decent carbonation. Smell: Scent is clean with a grainy, bread-like malt smell. Lots of sweetness comes through with notes of caramel and toasted sugar. Small sampling of hop spiciness makes it’s way across the nose but it’s only a wisp and grows more faint as you drink. Initial Taste: Starts off pretty mild and sweet with vanilla, caramel malt and toasted sugar flavors hitting the tongue first. The flavor then starts to dry out with a hop bitterness that is spicy more than floral. While the hops are certainly present they only make a dent in the malt-heavy backbone. Finish is somewhat dry with little to no aftertaste. 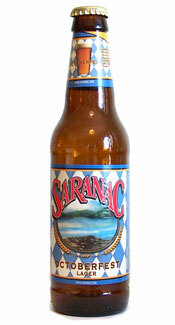 Thoughts: Saranac has created yet another very drinkable seasonal brew. The flavor is what you would expect; heavy on the malts, just like most other American Oktoberfests, with a hop bitterness that tries to balances out the sweetness. This is a solid, middle of the road Oktoberfest that is easy to drink and pairs well with German food. While the flavor isn’t really all that provocative this is forgivable as the lager is really sessionable. I believe this to be an acceptable trade off. I recommend this beer as it’s usually easy to find (and drink) and sure to please even the most untrained palates. Though if you you are looking for an Oktoberfest beer with lots of flavor you are best to look elsewhere. Cheers.